Years of transporting curtain wall panels of all different sizes from overseas and nationally has given Kingswood Aluminium the opportunity to refine a logistics method suited to every project. Kingswood Aluminium starts planning the transportation of a curtain wall panel at the initial design stage. 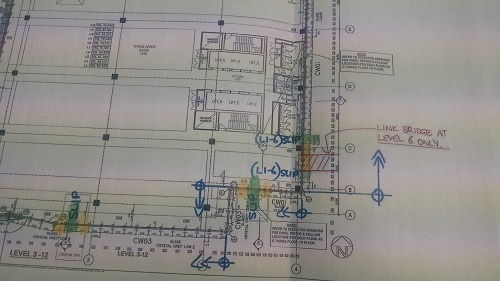 Identifying site installation challenges early on and developing installation sequences based on the builders construction stages. Curtain wall panels are fabricated in order of installation and packed into stillages in order of the site install. This fabrication and packing order enables stillages to be delivered to site in small batches, ready for immediate installation. This minimises unnecessary handling and storage on site. Transporting curtain wall panels from factory to site without damage can be challenging. As well as moving and maneuvering them onsite. To overcome these challenges, Kingswood Aluminium has developed a unique stillage called the K-Stillage. 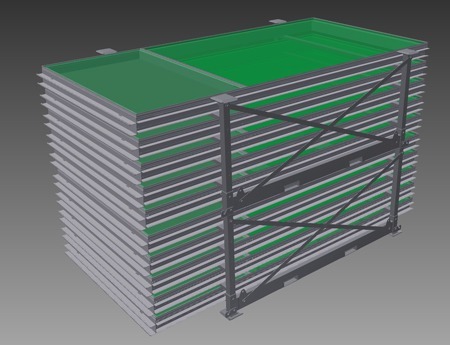 The K-Stillage can be adapted to carry varying depth curtain wall panels, varied sizes and lengths. The stillages allow for easy and stable stacking and are optimised to fit shipping containers. The K-Stillage is easily maneuvered onsite. Each stallage is tested to Australian Standards to be crane lifted, carried on fork or rolled on removable trolley wheels. After the panels are unpacked, the K-Stillage collapses down to a crate style assembly for easy removal from site and shipping back to our warehouse.